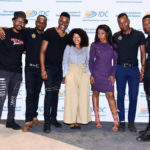 The IDC CEO Regional Roadshows, aimed at extending the IDC’s partnerships with women, youth and black industrialists across the country, got under way in Mbombela, Mpumalanga on Friday, 20 May. 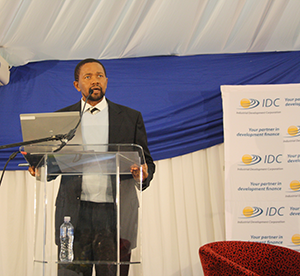 IDC CEO Mvuleni Geoffrey Qhena kick-started the IDC Regional Roadshow at Ingwenyama Conference and Sport Resort in Mbombela, Mpumalanga on Friday, 20 May. The roadshow, which will see Qhena visiting various regions to engage with key stakeholders from May through November 2016, are aimed at increasing awareness of the target sectors that the IDC supports, as well as the kinds of support that the Corporation offers. This, in turn, is aimed at attracting new clients, with the focus on women, youth and black industrialists. Friday’s event featured a keynote address by Qhena, testimonies by IDC clients, a question-and-answer session, exhibition and networking session. Addressing a packed audience of current and potential clients and other partners, Qhena said it was fitting that Mpumalanga, the “place of the rising sun”, should be the first stop of the IDC CEO Regional Roadshow. 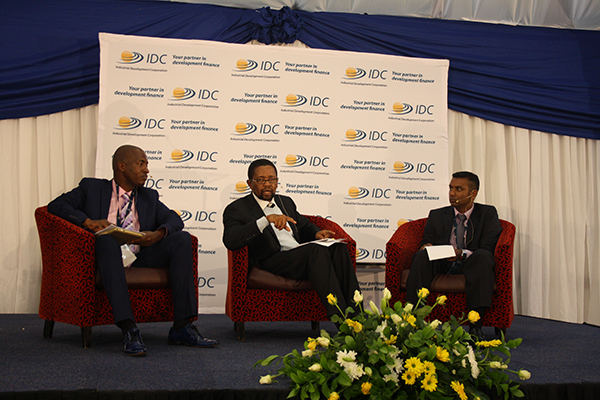 “Through this roadshow, we as the IDC hope that stakeholders can give us feedback so that can continue to learn,” he said. “Through these events, we want to ensure that we do more. “What makes businesses work is our partners, the passion they display, the sacrifices they make and their attitude of not giving up,” Qhena said. Qhena also spoke about the Corporation’s mandate, industrial development role, target sectors, as well as business and financial support. These, he said, included the province’s manufacturing capabilities, its resources, potential in tourism, and proximity to Mozambique, where resources such as gas are in abundant supply. “This province is well positioned,” Qhena said. A black woman-owned company based in Middelburg, Hlakani Engineering specialises in construction and maintenance, fabrication, equipment hire, turnkey projects, design and trading. 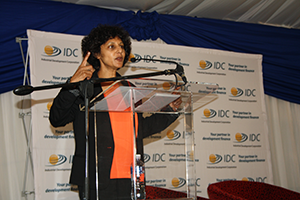 According to Naidoo, having a partner with the weight and reputation of the IDC has had a major impact on her company. “The IDC know our business better than we know it, which is great. The fact that the IDC chose to partner with us, a small company in a hard-core industry, has made a huge difference and allowed our company to feel more confident. The guidance of the IDC has also taken us from being a small company to positioning ourselves with big corporates’ – Lebo Malope, managing director of Bhangula Waste and Recycling. (Photo: Elias Nkabinde)Lebo Malope, managing director of Bhangula Waste and Recycling, said it was thanks to the IDC that he and his partners had been able to take an idea and “slowly and surely” turn it into an industry. 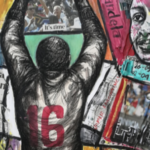 The 23-year-old entrepreneur outlined how his company, which is 100% black and youth-owned, was “taking recycling and turning it into a method to alleviate poverty in black communities. Founded in 2014, Bhangula Waste and Recycling has created 18 permanent jobs at its plant in KaBokweni Township in Mpumalanga’s Ehlanzeni District Municipality. The company applied to the IDC for financing to help fuel its expansion plans, was granted a R4.5-million loan in February 2015, and has subsequently bought state-of-the-art machinery along with two new trucks and a bakkie. The IDC began establishing its regional footprint nine years ago, and now has 14 regional offices and 10 satellite offices across the country. The strategy has been hugely successful in terms of the IDC’s mandate of driving industrial development and facilitating job creation. The regions contributed R3.5-billion to the R11.5-billion in funding that the IDC approved for the 2014/15 financial year. This has resulted in 102 deals being funded, with these funds being channelled through the regional offices. 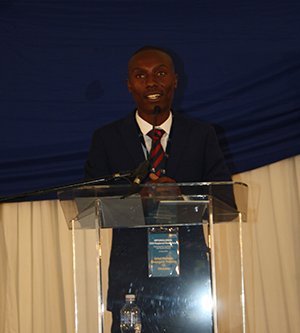 Speaking after the roadshow, Qhena described the day as a “great success”. “I think the question-and-answer session was especially engaging, because we were able to learn about stakeholders’ thoughts, ideas and frustrations. I have seen people that are passionate with plenty of potential,” Qhena said. “What stood out the most for me was the sheer number of people that want to do more and the positive stories that came of this roadshow. Everyone showed an interest in the IDC. “It was a very a good session.”,” he added.